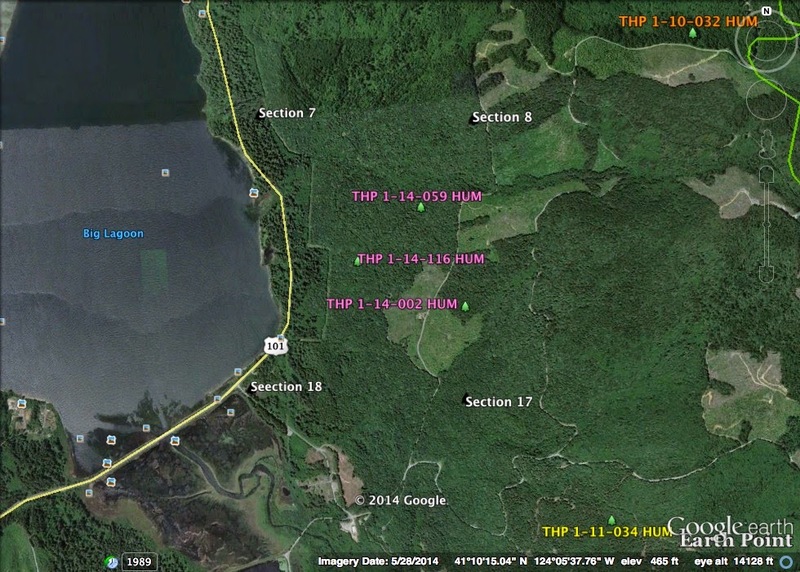 THPBlog: Green Diamond Resource Company to log near Harry Merlo State Park. Green Diamond Resource Company to log near Harry Merlo State Park. This THP is about 8 miles north of Trinidad, CA near Big Lagoon and Highway 101 and adjacent to Harry Merlo State Recreation Area. Green Diamond Resource Company is planning a tractor and cable logging operation in redwood, Douglas fir, grand fir and spruce forests at an elevation of 120 to 760 feet. There are 12 acres of a no-cut area around a marbled murrelet stand. The marbled murrelet stand is within 300 feet of unit A, and within .25 mi of the LP Mill Road, BL1110 and BL1135 haul roads. 15 road drainage sites are planned for work including rocking, dip construction, washed out crossings and culvert repair/replacement. Osprey nests are located within .25 mi of the LP Mill Road, 100 feet west of unit A, and .25 mi from the BL1110 and BL1135 haul roads. There is a bald eagle nest 930 feet west of unit A, and .50 mi from the BL1100, BL1110, BL1135 and LP Mill Roads. This THP is adjacent to Green Diamond Resource Company’s THP 1-14-002 HUM and THP 1-14-059 HUM. More information is available on the THP Tracking Center website.